Charleston, SC, 18th February, 2019 - MR16 lamps have long been known for their versatility in enclosed, focused lighting applications, both indoor and outdoor. Manufacturers tout specs like excellent color rendering (CRI & R9) and superior center beam candle power (CBCP). But looking closer, those advantages often come with extreme sacrifices in other areas like lumen efficacy, lamp lifetime (L70), dimmability and price. Original MR16 lamps used a Multifaceted Reflector inside a 2 inch (a.k.a. 16/8ths of an inch) diameter body to produce desired beam spreads. A tungsten halogen light source, paired with a coated, multifaceted inner body directed the light. In the LED version, optic lenses and a single source LED do the job. But, an opportunity for real innovation has gone somewhat untapped until now; the circuitry inside the lamp. “MR16s are probably the most technically-advanced lamps on the market. The challenge to manufacturers is to cram all of that performance into a very small footprint. Luckily, that’s been EmeryAllen’s specialty since the beginning. Our “outside-the-box” thinking in regards to circuitry, shape, materials and overall design leads to 90+ CRI lamps with the same lumen efficacy as someone else’s 80 CRI lamp,” says Tom Garber, President of EmeryAllen. EmeryAllen’s expertise in high-performance miniature lamps did not disappoint when it comes to their unique-looking MR16s. A ceramic body with a concave, rather than convex, shape keeps the lamp cool and the footprint small. 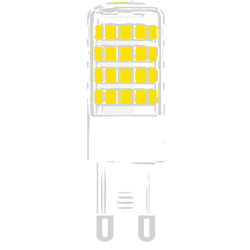 The lamps are 90+CRI and have R9 values over 60, but with up to 103 lm/W lumen efficacy (about 30% higher than market average). The lamp is truly a game changer when you also add on unmatched dimming, interchangeable use on magnetic or electronic transformers, a lifetime warranty and a price point that’s accessible to everyone. EmeryAllen’s MR16 bulb line-up consists of thirty patent-pending 12v bulbs, offered in 3 wattages (3.0W, 5.0W and 7.0W), 2 color temperatures (2700K and 3000K), and 5 beam spreads (15°, 24°, 36°, 60°, 120°); all offered in the standard GU5.3 base configuration. The bulbs are a seamless replacement for 20-50W incandescent/halogen MR16s in applications like landscape lighting, recessed can lights, track lights, pendants, task lighting and more. Customers can visit EmeryAllen's website to see technical specifications of the bulbs and where to buy them. Founded in 2015, EmeryAllen is the leader in the design, development and distribution of high performance, miniature LED replacement lamps. Their patented electronic technology goes into an impressive lineup of bulbs, which take the place of miniature halogen and incandescent light bulbs in residential, commercial and hospitality applications. Designed specifically for North American lighting applications, EmeryAllen’s products have the best lumen efficacy on the market (over 100lm/W). And, they meet or exceed the safety and energy requirements of UL, the National Electric Code of the State of California and the US Department of Energy. Link Outdoor Lighting provides landscape lighting contractors the quality, commercial-grade products and expertise they need to succeed. Founded by Chuck Link in 2015, the company is located in Altamonte Springs, Florida and has built their reputation around offering customers reliable products at a fair price. Link Outdoor Lighting’s attention to detail, product/training videos and open-door approach to customer service turn lighting professionals into loyal customers every day. Find out more at Link Outdoor Lighting. Press Contact: For more information, please email Michelle Witt at michellew@emeryallen.com.